It’s the horrific attack that causes shivers down your spine upon hearing that it’s happened to yet another innocent person. They may have been walking down the street, partying in a nightclub, or even just leaving their house, when a bottle of acid is thrown into their face, searing their skin, and leaving victims with unimaginable pain and scars – both mentally and physically – that will stay with them for a lifetime. And heartbreakingly, it seems this horrendous method of attacking people is happening more than ever before. The attacks have been happening with terrifying frequency over the past few months too, with the MET Police reporting that a staggering 118 attacks have occured in the capital over the last 12 weeks. 261 in 2015, to 454 in 2016. This attack is just one of the latest occurrences of this vicious means of attacking someone. Bottles of acid have become somewhat of a weapon of choice for gangs now – to horrific consequences. Around the world, it’s undeniable that most high-profile cases – including Katie Piper, who was subject to an attack ordered by her ex-boyfriend in 2008 – seem to be women. And the idea that most victims of acid attacks are women does seem to ring true – with a huge 80% of reported crimes against females. Harrowingly, one man involved in gangs who use the terrifying method, has spoken up about the reason why women are so targeted. And it seems that really, the women are simply a ‘casual’ by-product victim of tension between groups, or ‘gangs’ of men. Speaking in an interview with VICE, the man, whose identity is unknown, revealed that acid attacks on women are often a way of getting back at the men they’re close to who are a part of rival gangs. But he also revealed that he’s more likely to use it on a woman as he believes it presents a bigger impact on a female than a male. He even went as far as to say that he would rather physically attack a man, than use acid on them. He said, “On a guy I probably wouldn’t, I’d probably do something physical, but on a girl, they love their beauty. “On a guy, if you get scarred, it’s a scar and you show it to your guys, ‘yeah this happened to me, innit. Yeah it’s nothing, it’s nothing’. But sickeningly, despite this, it seems no one is exempt. On 8th April, a family walking in Islington, young child in tow, had acid thrown on them, leaving the father with life-changing injuries. On Good Friday, a man was sprayed in the face with ammonia, while the attackers sped off with his car while he fell to the ground. On Wednesday 19th April, a teenager, along with a female friend, suffered serious burns to their necks when they were attacked in Fulham. In India particularly, acid attacks are prevelant – so much so, that the government added regulations tailored to acid attacks to The Indian Penal Code. Women there are attacked largely by jealous men and ex-lovers – a motive for up to 41% of the attacks from 2010 – 2013, according to The Huffington Post. 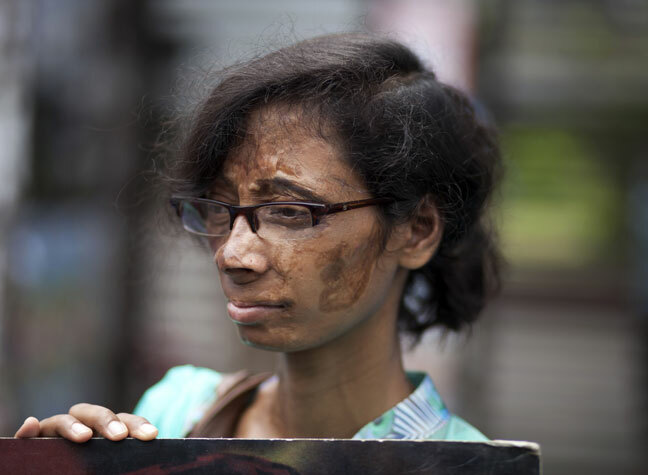 Acid throwing is also a huge problem in Bangladesh. Approximately 300 people are attacked every year, with a huge 41% of victims under the age of 18. And perhaps the most scary thing about it all, is the fact that the weapon, the acid itself, found in drain cleaners, is legal, cheap, and readily available in supermarkets. The attackers often have a genuinely terrifying motive behind the crime. Rather than attacking with the aim of killing, most people using acid do so in order to ruin the life of the person they target – to cause unforgettable pain and to leave permanent scars. “The primary motive of an acid attack is not to kill, but to leave its mark on an opponent – to disfigure someone for everyone to see. That’s why the face is often the target,” Jaf Shah of the London-based charity Acid Survivors Trust International told Vice. But there’s hope. Groups around the world are popping up, supporting those who have been attacked – such as a beauty salon for acid burns victims in Pakistan. Katie Piper has also set up the Katie Piper Foundation, aiming to raise awareness of the struggles of acid attack victims, and for the treatment she received to be available nationwide. There are also multiple calls from victims and support groups and the world to enforce stricter sentences for those who carry out acid attacks, in the hope that it will discourage them from happening. The ultimate hope is to eradicate the use of acid altogether. But while it’s difficult to make that happen, be assured that people will continue to campaign for the good.